Sorry for the late June update. It seemed that not too long ago July had just started! I just moved to Chicago for work and have been busy getting settled here. I’ll post an update about that soon. Also, a new update is coming about another investment idea that I’ve been working on. June has historically been one of the higher payout months. 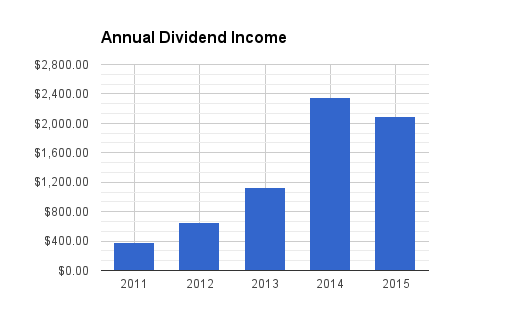 Total dividend income for June 2015 was $451.84. In June 2014 I received $295.02; in June 2013, I received $143.66; and in June 2012, I received $77.18. I like the trend that I’m seeing! Nice progress update! Your lending club returns look solid. I always wonder when I see others using LC: what does your horizon look like? Since LC is fairly new, are you still beta testing the platform with your method? Or are you in it LT? Thanks! The Lending Club has been working out pretty well so far. I only contributed $2000. Partly because I just want to try it out and partly because I don’t have much more available money right now. So far I have had two loans paid off early (paid off in less than 6 months a 3 year loan). That’s good for the people that have the loan but not good for collecting interest for me. I also have 1 or 2 loans which are 10-20 days late in payment. That dropped my annual yield from 11% to a little over 9%. We’ll see how those work out.